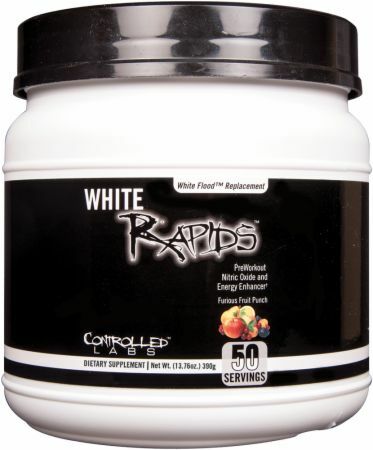 Controlled Labs has unleashed a brand new pre-workout White Rapids to replace the much beloved White Flood Reborn. Will it surpass its predecessor? In the world of pre-workouts supplements, there are two groups: the contenders and the pretenders. While there are a litany of the latter, very few fall into the former. Controlled Labs, thankfully, has always delivered a rather effective and cost-efficient product that left little to doubt. White Flood, and later White Flood Reborn, were the backbone of CL’s pre-workout supplementation line and has since expanded to include White Pump (stimulant-free pumps) and STIMino (light amino energy style drink). Instead of upgrading White Flood again, they’ve started from scratch and unleashed a brand new product sure to keep them in the category of true contenders… White Rapids! Before we begin, let’s quickly state that there is 150mg caffeine per scoop. 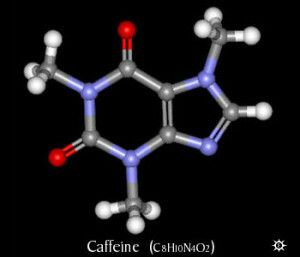 If you glance at it quickly, you might think it’s 75mg, but there are two forms of caffeine, each at 75mg. So this is going to be a ~1.5 – 2 scoop workout supplement for the majority of our readers. As we’ve seen with CL’s latest additions to their workout supplementation line (White Pump, STIMino, GlycerGrow 2, etc) we have a completely open label with no proprietary blends! White Rapids breaks from the proprietary blend of its predecessor and has a completely open label, and what a profile it is! This is a huge step forward for the company as all of their previous iterations of White Flood contained a variety of proprietary blends. White Rapids goes back to the drawing board, trimming away the excess, bringing in a few fresh faces, and leaving us with just effective ingredients designed to take your workout from regular to rapid! We’ll kick things off with the pump powerhouse in White Rapids, L-Citrulline Malate. Here is our first clear break from the White Flood lineage, as previous iterations have used Citrulline and L-Norvaline as its pump-inducing ingredients. Citrulline Malate is readily absorbed by the body and raises blood levels of arginine in the body better than supplementing with various other nitric oxide (NO) boosters. This leads to higher NO production in the body increasing blood flow to the muscles and resulting in a much bigger, badder PUMP! 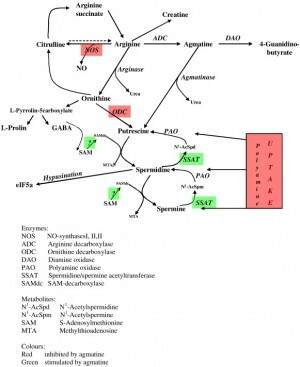 On top of that, citrulline malate acts as a buffer in the body removing ammonia and lactic acid accumulation which increases the natural production of ATP and endurance. [2,3,4,5] The end result is improved energy production and workout performance. In order to get these benefits, you’ll need to make sure you’re taking at least 2 scoops to get in the 6-8g range needed to see these improvements. So far we’re off to a great start and we’ve just scratched the surface! 2 scoops of White Rapids, and you’re well on your way to the clinical efficacious dosage of 2.5g TMG! If you’re familiar with CL’s GLycerGrow 2, then you’re well-acquainted with this ingredient. HydroMax™ is a concentrated form of powdered glycerol (65%). This means it 65% glycerol. Why is this a big deal? Most pre-workouts that use glycerol monostearate, while decent, it only 25% glycerol and 75% saturated fat! When used as the standalone pump ingredient in a product, 500mg usually wouldn’t cut the mustard. HOwever, seeing as this is meant to be a 2-scooper and coupled with the pump-inducing properties if Citrulline Malate and Hydromax™, you’ll be in pump-fiend heaven! 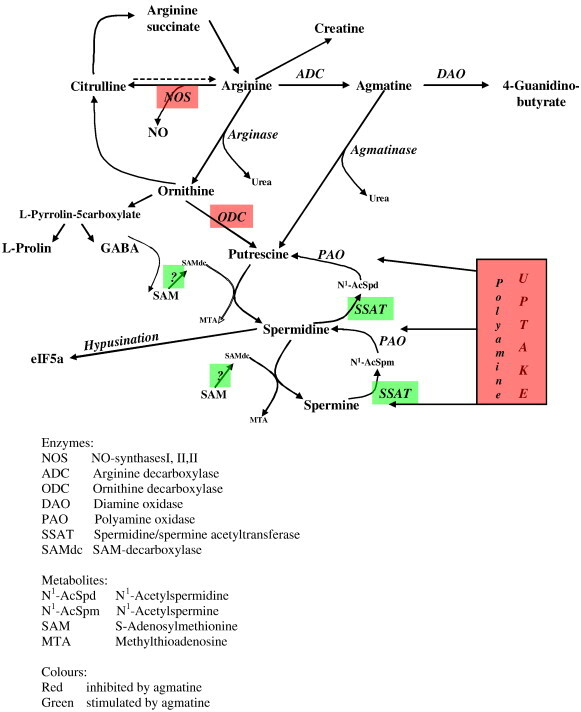 Another interesting tidbit is agmatine also functions as a rather potent neurotransmitter. It actually prevents the breakdown of L-Arginine, which leads to more intense and longer lasting pumps!We’re not done yet! Agmatine also possesses cognitive benefits as well enhancing memory formation. So, not only will your pumps be unreal with the combination of all the aforementioned ingredients, but you’ll also have tunnel-vision like focus when you’re grinding through your latest German Volume Training workout! Now we get to the real crux if this will be a true 2-scooper or not, the almighty stimulant kick! 75 mg may not seem like a whole lot of caffeine per scoop, but remember this is only one of two forms of everyone’s favorite drug. We’ve also got Dicaffeine Malate, which we’ll get to next!Caffeine Anhydrous increases mental alertness and provide the energy surge you need to maximize your training. However, caffeine is much more that just a common stimulant. Dicaffeine malate is another stimulant that contains both caffeine and malic acid. So what’s the difference between this and caffeine anhydrous?Basically, dicaffeine malate is a buffered version of its anhydrous counterpart. Caffeine is ionically bonded to malic acid to create a unique form of the stimulant. The malic acid is eases the digestive effects of caffeine on the stomach. What we’re left with produces the same results as caffeine anhydrous while protecting the stomach from any sort of upset and the body enjoys a much smoother “kick” from the stim hit. Choline supplements are widely regarded to improve mental cognition and focus. Of course, there are several different types available in supplement form (choline bitartrate, CDP-choline, etc.) that can leave the end-user somewhat confused as to the most effective. Alpha-GPC has shown to be the most effective form for the body. Not only does it improved mood and focus, also boosts power output, increases endurance and post-workout Growth Hormone (GH) level! [17,18,19] It also has the added benefit of enhancing the “mind-muscle connection” allowing you to really “feel” the muscles working in each contraction so you get the most out of each and every rep. So if you’re worried about being too “amped up” or jittery from the caffeine dose at 2 scoops, Alpha-GPC will translate that surge into laser-focused, tunnel vision. Putting you in a “zone” you never felt before. While the dose may seem low initially, when combined with Huperzine and our next ingredient, you’ll be well on your way to unheralded focus. Note: The Alpha-GPC here is at 50% ‘strength’ (it’s often bound to silica so that it makes a nice powder). Controlled Labs informed us that White Rapids contains 100mg Alpha GPC 50% strength, thus yielding 50mg actual Alpha GPC 50mg. Evodiamine is also known as Wu Zhu Yu, and has traditionally been used in Chinese medicine as a weight loss supplement. It functions similarly to capsaicin (red hot pepper extract) in that it stimulates the vanilloids in your body and reduces fat uptake by the cells. Additionally, it suppresses circulating levels of caffeine in the body. [21,22] This will help to smooth out caffeine’s effects and offset any issues you may experience if you are prone to the “jitters” typically attributed to caffeine by those who are stim-sensitive.One last tidbit about evodiamine is it has a mental boosting aspect as it improves cognition. But CL is not done yet, we’ve only covered two of the components in this trifecta of focus boosters in White Rapids. This ingredient may sound strange to you, but it’s more commonly known as Huperzine A. Here we have another focus booster in White Rapids and it is indeed our final ingredient in the product. It works by slowing your brain’s breakdown of “learning neurotransmitter”,acetylcholine. This indirectly increasing circulating levels of the potent neurotransmitter, but that’s not all!It’s also neuroprotective against glutamine (“the neuron death molecule”) and potentially neurogenerative (helping to create new brain cells!). 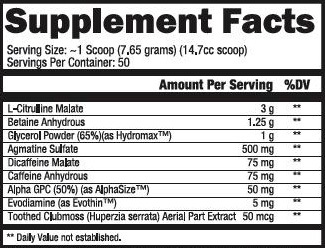 While the amount might seem miniscule, its the standard dosage in most pre-workouts on the market and if you use this at the recommended 2 scoops, you’ll get double this dosage which will enhance its effectiveness tremendously! Are you ready for the Rapids? Once it hits store shelves and online retailers, White Rapids will be available in two serving sizes: 10 servings and 50 servings. If this is your first experience with a Controlled Labs pre-workout or new to pre’s in general, take 1 serving of White Rapids™ with 4 oz. of cold water and drink it 30 minutes before your workout. If you’re a grizzled vet of their products or have a high stim tolerance, combine 2 scoops of White Rapids with 8-10 oz. of cold water and consume it 30 minutes pre-workout. There are 50 Servings Here! Sometimes, we get offended at “two-scoopers”, but that’s when there’s 30 or so “servings” per container. Not the case here – this has 50 servings, meaning you can get anywhere from 25 to 40 incredible workouts out of it, and it will be right in our price range. So you can get the idea of what they’re going for here: flexibility, effectiveness, and value. By the looks of it, our beloved White Flood seems to have finally been unseated as the de facto Controlled Labs pre-workout. Dosed at 2 scoops, White Rapids stands to usher in a new standard for pre-workouts in terms of energy, stamina, and above all… PUMPS! Through a combination of proven workout ergogenics like caffeine, betaine, and citrulline malate coupled with newcomers like HydroMax and AlphaSize, White Rapids looks to be a premier addition to the Controlled Labs family of products. We can’t wait for the upcoming release of the product (and impeding review!) to see how it RAPIDLY it accelerates our gains! Read more and bookmark our Controlled Labs blog page, which will have all of the latest news on their supplement line. Either way, your link to Controlled Labs’ White Rapids is below. Grab a tub and let us know if you can handle the RAPIDS! 4 Comments | Posted in New Products, Supplement News | Tagged Agmatine Sulfate, Alpha-GPC, Betaine, Caffeine, Citrulline Malate, Controlled Labs, Evodiamine, Huperzine A, HydroMax, Pre Workout Supplements.